It doesn’t seem like ten years have passed since I built a reproduction of the Byrdcliffe Sassafras Linen Press, but time has marched on. Building that piece opened my eyes to a different way of thinking about furniture and color, and this summer I managed to find the time to pay a return visit an old friend. The carving at the right is adapted from the original design of the right hand door panel of the linen press. The carving is a depiction of leaves on a branch of a sassafras tree. The sassafras tree has five different shapes to its leaves, shown here in autumn colors. Sassafras root also makes a great tonic, in our neighborhood we can get Pappy’s concentrate in a bottle. When you work with sassafras it smells like root beer. But the panel isn’t made from sassafras wood, even though some descriptions of the original linen press say so. That’s confusion between the subject and the material its made from. 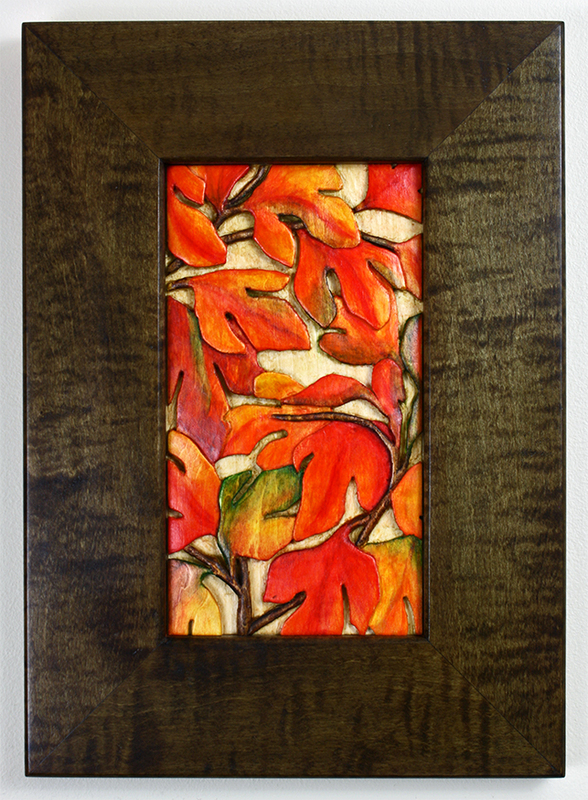 The panel is hand carved basswood, 5″ wide x 9-1/4″ high, and the quilted maple frame is 10″ wide x 14-1/4″ high. 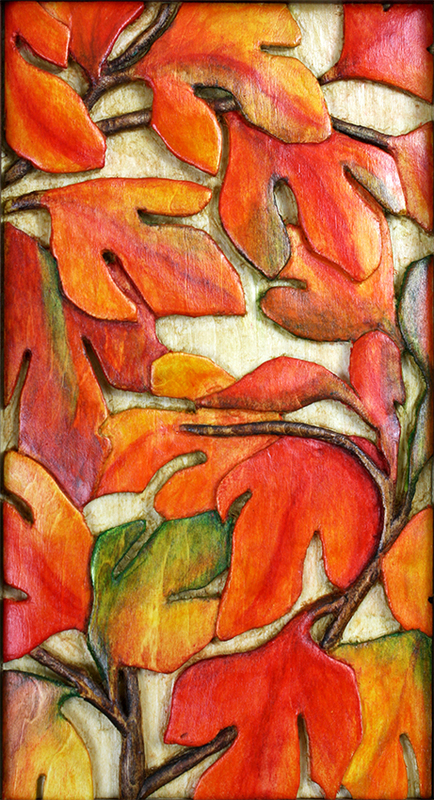 After carving, the panel is sealed with shellac and the colors are applied using light-fast watercolors. Another coat of shellac seals the color in and then the panel receives a top coat of lacquer. The frame is dyed an olive green and finished with shellac, then lacquer. As with all my work I use some machinery for initial stock preparation but all of the carving, coloring and finishing is done by hand. These pieces are unique and I imagine there is a spot in your house that could use a reminder of a beautiful fall afternoon on a permanent basis. Click my signature below to contact me by e-mail to discuss commissioned work.